While visiting the market in North Africa, especially in bigger towns, it does not take long before children come to you begging for money. It is hard to withhold helping them when they are so dirty, skinny and needy. However, to give them money is to give the mosque money. These boy and girl beggars are employees of the Imam. Therefore, we give them bananas or a drink of clean water. And what they really need money cannot buy; they need the riches of Jesus Christ. As we arrive in Acts 3, we arrive to a church that is newborn. Peter has just preached his heart out, the Holy Spirit is at work, and thousands were added to the church. The infant church was booming with excitement. The day after Pentecost, Peter and John head to the temple for mid-afternoon prayer. On their way they pass by the local beggar. He’s in need of a turning point. Doctor Luke gives careful details that this beggars been crippled since birth. He’s never walked. He probably slept near the gate and carried him up lots of stairs to his post at the gate each day where he hoped for a handout. He’s been doing this for 40 years. Isn’t it ironic that the beggar is by the beautiful gate? Can you see the contrast? The gate was a modern marvel and a symbol of wealth. It was an ordinary dirty bronze gate, but it was overlaid with silver and gold. In the light it glistened. And beggar sitting next to it as a stinky, dirty, and pitiful eyesore. The two apostles make eye contact with the beggar. Have you ever made eye contact with a beggar? There is an unspoken vagabond code that says: ignore the beggar and he won’t bother you, but if you make eye contact expect to dish out. I have been around beggars. I am guilty of taking the long way around or looking the other way pretending to be fixed on something important. It is like being in class and your teacher asks a question that you do not know the answer therefore you dare not make eye contact lest you be chosen. Strangely Peter and John call the beggar to look at them. Peter and John have literally sold everything they owned to serve Christ [2:44-47]. They do not have what the beggar wants, but they do have what he needs, “I have no silver and gold, but what I do have I give to you. In the name of Jesus Christ of Nazareth, rise up and walk!” [3:6] I am sure the man was disappointed or felt shortchanged at first, but Peter took his hand and helped him to his feet. The man not only began walking but also began jumping [Isaiah 35:6]. It’s something he’s never done before, even as a child. And like a child he’s not shy to show his joy in what God has done. He has just become a living, breathing, walking, and talking commercial of Jesus’ power and provision. I am sure he was an undignified spectacle within the temple. I love the excitement of the beggar. He worships God and cares less what the crowd thinks. All the while the religious around him are thinking, “Settle down rookie. Your zeal will fade in time.” The religious are usually the most cantankerous. God detests the religious and their man-made rules and regulations. Long gone are the days their passion for God and joy in the transforming power of the gospel. Third, the riches of Christ are infinitely greater than the wealth of this world. Salvation in Christ is the greatest rags to riches story of the universe. How amazing it is that God can rescue a soul signed to an unending lease within hell and pay his sin debt and freely offer him an opulent room and inheritance within His kingdom. When theologian Thomas Aquinas visited Rome he met with Pope Innocent II. Aquinas was amazed by the opulence of the Vatican in that day. And this was prior to the building of St. Peter’s, but even then it was a glorious headquarters for the Catholic church, filled with riches, and the pope was somewhat proud of the riches, and he said to Aquinas, “No longer do we say, ‘Silver and gold have we none.’” Thomas looked at the pope and said, “Maybe that is why we can no longer say, ‘Rise up and walk.’” Now the church’s riches were not why the church lost its power to heal people. The reason is that the power evidenced in the early days of the church was given by Christ to His Apostles to establish the church. Aquinas knew that, but I guess he did not want to miss the opportunity to jab the pope. Today the church has great wealth. Little of that wealth goes to global gospel ministry. In fact, 95% of the churches money, people, and resources go to Christians. All the while unreached worldwide remain heavily unreached. I was confronted by this truth just this week. I attended a pastor’s conference with nearly 2000 pastors and missionaries. At the conference I met, Tyrone, an employee at the conference center. I watched as he opened doors for servants of God, but not one person acknowledged he existed. He was a beggar in our midst. You have beggars in your midst too. The sermon was also a scorching indictment of all who gathered. It’s as if Peter points a finger in their faces saying (with three pointed back at him), “You are the very people who betrayed Christ, who delivered Him, screamed for His blood, and are guilty of His murder. By the power of that same Jesus, this man was made whole. It wasn’t me, but Jesus.” Peter also a former denier acknowledges their ignorance [3:17], but they are no longer, so the only solution is to repent and turn to Jesus. Jesus on the cross, cried out, “Forgive them, for they do not know what they do” [Luke 23:34]. Doing ministry in name of Jesus is what got the apostles into trouble. Jesus and His growing group of followers were a sore subject for the Jews [4:2, 17; cf. Luke 20:27-40]. They thought Jesus was a joke, a fake, a blasphemer, and the same went for His followers. Earlier crowds convicted Jesus of a crime, which led to His death. Now the religious leaders threw the apostles in jail hoping they might think a bit. But the next day, they were brought out before the religious big wigs they did not back down from making Jesus known. Jesus is the focus of the apostle’s ministry. So should yours. It’s not about the numbers in the crowd [cf. 4:4], coolness of the program, effectiveness of the event, or pat on the back for your faithful years of service. It’s about lifting high the majestic name of Jesus. This might not make you the most popular person, but it gives credit where credit is due. Peters words cut to the core of the issue: “Salvation is found in no one else, for there is no other name under heaven given to men by which we must be saved.” [4:12] These are not politically correct, tolerant, or sensitive words, but true words nonetheless. Christianity is exclusive: Jesus is the only way to God. But it is also inclusive: for all who would believe on Him. There is even more here that you need to see. Sometimes people will say, “Yes, Jesus is the only source of salvation, but you don’t have to know Him in order to benefit from the salvation He offers.” In other words, “If you are a faithful Muslim or Hindu or Jew or animist, Jesus will save you. There is salvation in no one else, but you don’t have to believe on Him in order to be saved by Him.” That is modern day universalism. It’s heresy! Is that what Peter said or meant? Peter focused on the name of Jesus, “There is no other name under heaven by which we must be saved.” He did not say there are some other names by which you can be saved and Jesus is one of them. “There is no other name,” and Jesus’ name is your only entrance into fellowship with God. Peter says in Acts 10:43, “Every one who believes in Him receives forgiveness of sins through His name.” The name of Jesus is the focus of faith and repentance. In order to believe on Jesus for the forgiveness of sins, you must believe on His name. That is, you must have heard of Him, know of His saving work on the cross, and understand He rose from the dead. Paul echoes in Romans 10:13–15: “Everyone who calls on the name of the Lord will be saved. But how are men to call upon him in whom they have not believed and how are they to believe in Him of whom they have never heard? And how are they to hear without a preacher? And how are they to preach unless they are sent?” There is salvation in no one else—and that means there must be missionaries, who make Him known by name so that people can believe and call on His name for salvation. “Jesus is the way, the truth, and the life, apart from Him no one comes to the Father” [John 14:6]. Jesus is absolutely unique. He is absolutely supreme among all the gods and lords of the world religions. Knowing Him and believing on His name is absolutely necessary for salvation. Peter’s sermon is calling us to Christ. It calls you to clarity. It calls you to understand your faith. If all sincere roads lead to an afterlife, then understanding the road you are on to make sure it is the right one is not very important. If there are not many ways to God, but only one way, then the highest priority in life is to understand Jesus and follow Him. The supremacy of Christ as the only way to God calls for clarity. This is important in a world of universalism. Make the message of Jesus clear! It calls for courage. There is no point in dying for your faith if another way will lead you to God. What gets you killed is to believe Jesus is the only way. Around the world Christians are being martyred, I met some former Muslims who became Christian in North Africa. In the early days they were beaten, threatened, kick out of their families, fired from their jobs, and ostracized from their communities. Living for the name of Christ is difficult. It takes courage. It takes courage to speak to the beggars. Are you courageous? It calls for humility. Humble yourself to the name of Christ. What is the use of making your name great when in a few generations it will be forgotten? The name that will last forever is the name of Jesus. Fan the flame of His fame. Humble yourself and give the credit for the good in your ministry to Jesus. You cannot pack your credentials in your coffin when you die. Work hard to deflect attention off you onto Christ. 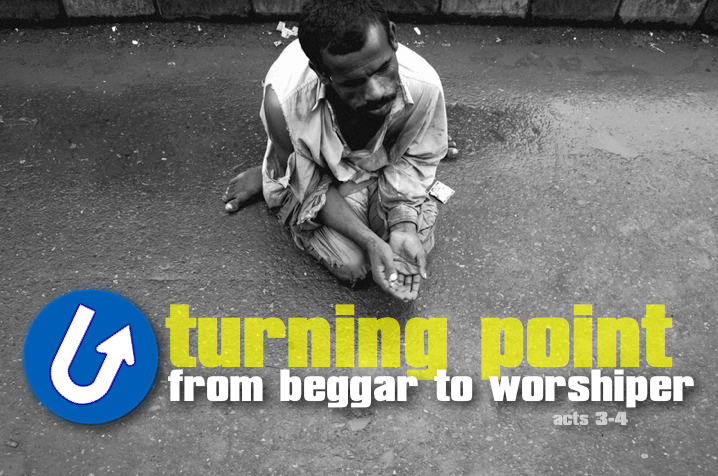 This is the response of a beggar turned worshiper. Today can be your turning point! Sproul, R. C. (2010-11-03). Acts: St. Andrew’s Expositional Commentary (pp. 76-78). Good News Publishers/Crossway Books. Kindle Edition.